^ "NINJA GAIDEN紹介". ファミリーコンピュータMagazine [Family Computer Magazine] (in Japanese). January 15, 1988. Archived from the original on August 24, 2016. Retrieved July 30, 2016. ^ Lada, Jenni (December 13, 2012). "Nintendo Downloads for December 13, 2012". Technology Tell. Archived from the original on April 23, 2016. Retrieved April 11, 2016. ^ Skistimas, Craig; Hanley, Thomas (2010-09-15). 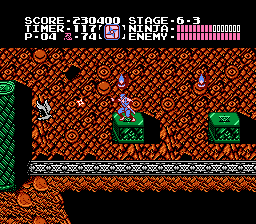 "Top 10: Hardest NES Games". ScrewAttack's Top 10. ScrewAttack. Archived from the original on 2011-12-27. Retrieved 2012-01-02. ^ "TenSpot Readers' Choice NES – 10. Ninja Gaiden". GameSpot. 2006-06-17. Archived from the original on 2012-02-18. Retrieved 2011-12-23. ^ "Top 100 Video Game Moments – Ninja Face-Off". IGN. Archived from the original on March 5, 2012. Retrieved April 2, 2012. ^ Concepcion, Miguel (2011-09-20). "The 50 Best Video Game Cut-Scenes – 2. 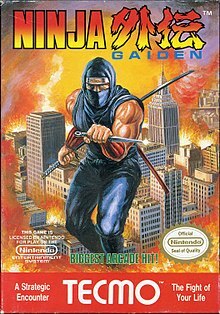 Ninja Gaiden (1988)". Complex. Archived from the original on 2011-12-28. Retrieved 2012-04-02. 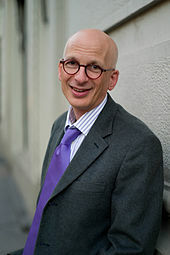 This page was last edited on 25 April 2019, at 22:33 (UTC).